‘Fleet Pond Volunteer of the Year’ Award. This is an award that was initiated by Councillor Sharyn Wheale during her term as Chairman of Hart District Council and is made to someone who you think has gone the ‘extra mile’ in their voluntary work for the benefit of Fleet Pond of the Society. Nominations must be received by the beginning of February. Many thanks for the interest you’ve shown in Fleet Pond Blog this year. We’ve been fortunate in having had over 65,000 visits since it started in July 2008! Until then, have a Merry Christmas and a Happy New Year! 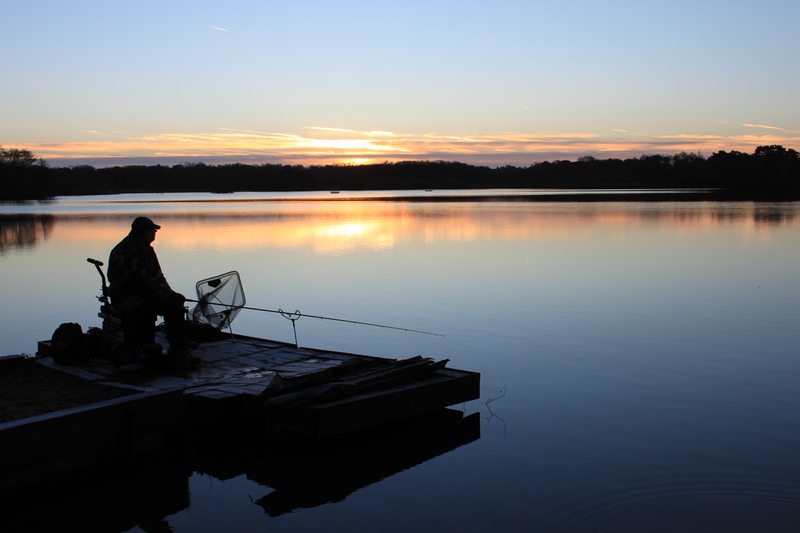 By the way, if you decide to go for a walk round the pond during the holiday period, why not take your camera with you and, if inspired, enter our photography competition for 2011? The deadline for entries is January 13 next year. The pictures above (winner) and below (runner-up) are from the photography competition for 2010. 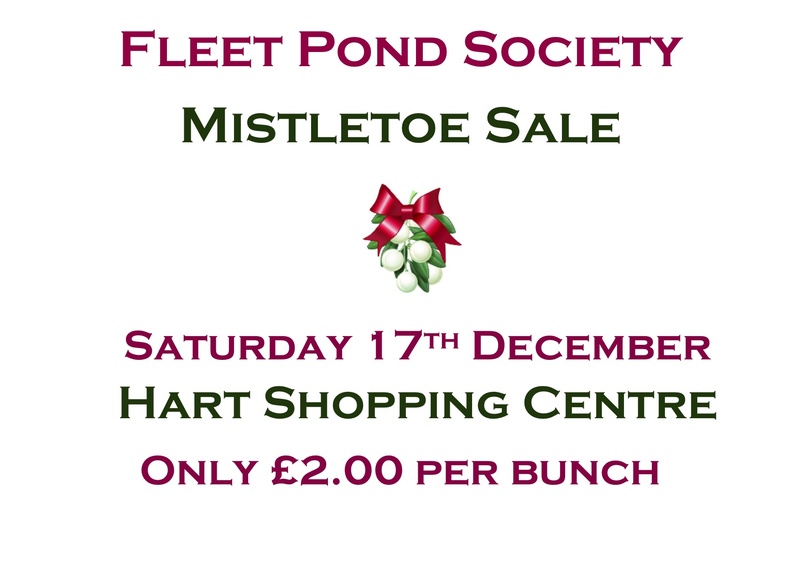 Thank you to all the shoppers who stopped to buy mistletoe and Christmas cards from the Fleet Pond Society stall in the Hart Shopping Centre on Saturday. 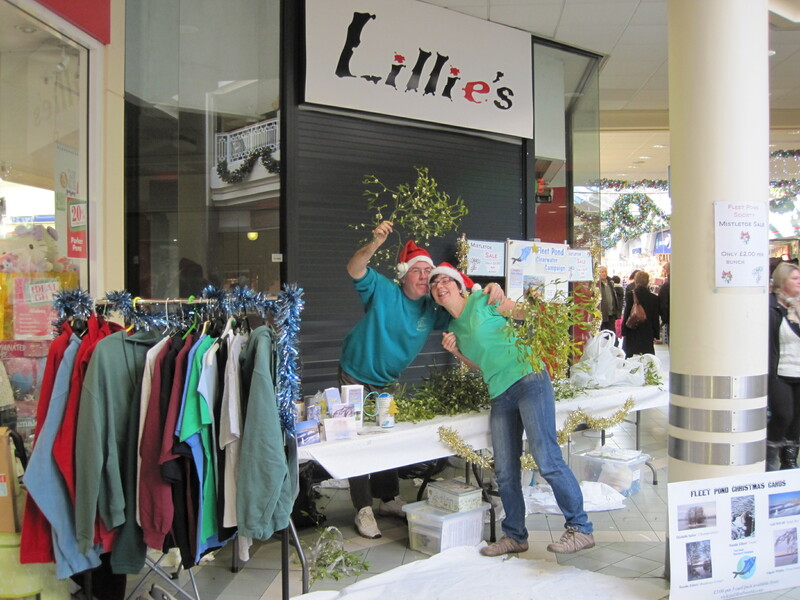 We had great fun, and judging by the hundreds of bags of mistletoe we sold, there is going to be plenty of kissing going on in Fleet this Christmas! Also, a big thank you to Jim Storey and Laurie Heath for plundering an apple orchard in Somerset and trying to break the world record for how much mistletoe you can cram into a white van. 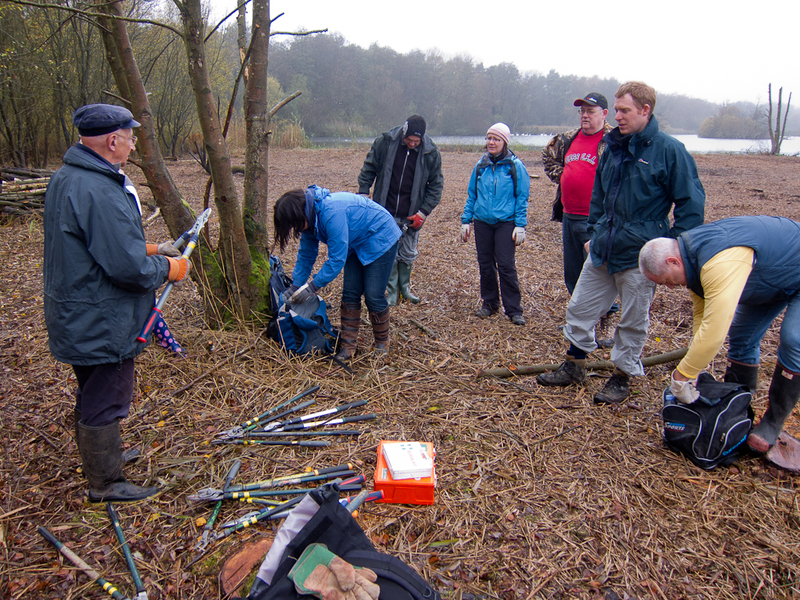 Expertly directed and led by Colin Gray, Chairman of Fleet Pond Society, a working part from BT spent a day helping to clear an area of trees and saplings to allow the area to regenerate back to its natural reed bed status. The 8 person team were participating through BT’s Volunteering scheme which sees employees making a difference in their local communities. The team enjoyed the opportunity to swap their desks, computers and conference calls for a day of outdoor physical activity. 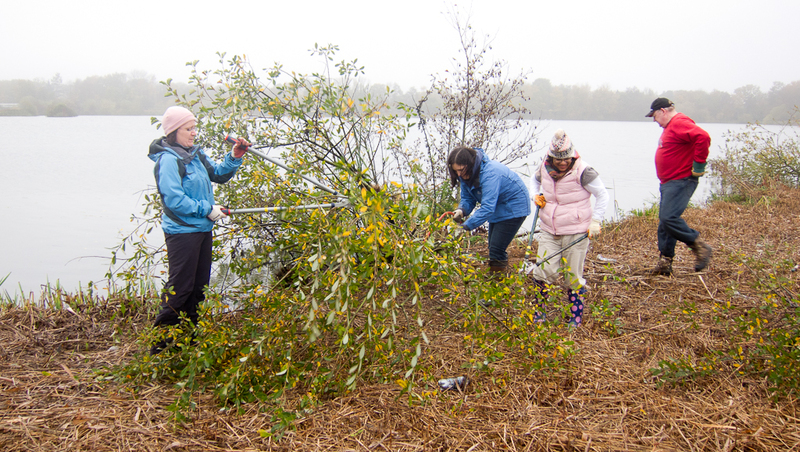 Whilst the main aim was to help in the Society’s conservation programme, the day brought the team together in a way that is not achievable within an office environment. It was a tiring but a rewarding day and all agreed that it is something we would look into doing again! By now, I’m sure many of you have noticed the greatly improved access to the pond at the end of Wood Lane through the new bridge. This is a really good example of Fleet Pond Society (working closely with Hart District Council and a local business Cove Industries) helping people appreciate the pond and it’s facilities. The background to the bridge project is quite fascinating! “The old, but much valued Fleet Pond ‘Carnival Bridge’ has been given a new lease of life as well as a new position in the Reserve thanks to the generosity and skill of the staff at a local business, Cove Industries. The recent official opening was a very special occasion as the guests of honour were the family of Charles Woodman, to whom the original bridge had been dedicated at its opening ceremony in 1979. 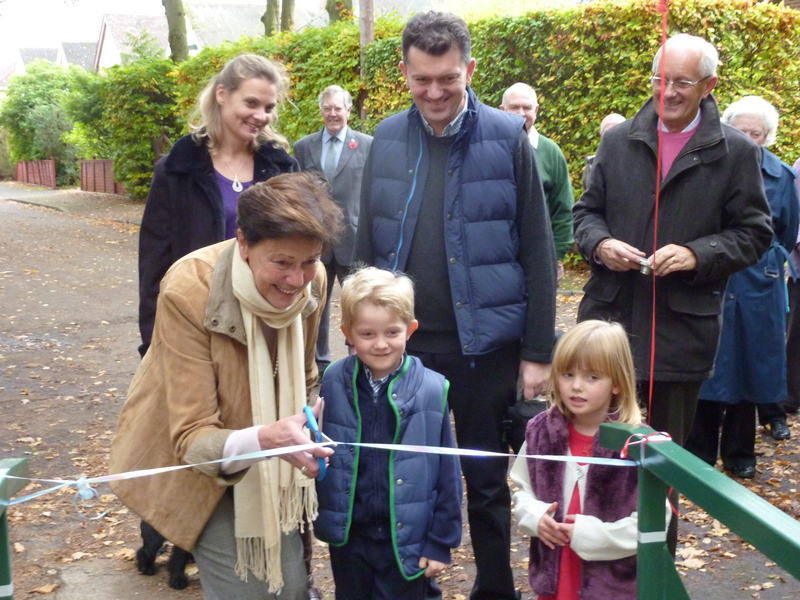 On that occasion it was opened by his widow Mrs Kathleen Woodman, this time it was their daughter, Beaulah Bower, and her family who were thrilled to cut the ribbon. In 1979 a £500 donation from the Fleet Carnival Committee, of whom Charles Woodman was the first President, met the cost of the new bridge. It was dedicated to him in gratitude for his valued service to the community, and this was recorded on a commemorative plaque. So the Fleet Pond Society was absolutely delighted when his daughter agreed to open the refurbished bridge and keep that important link. 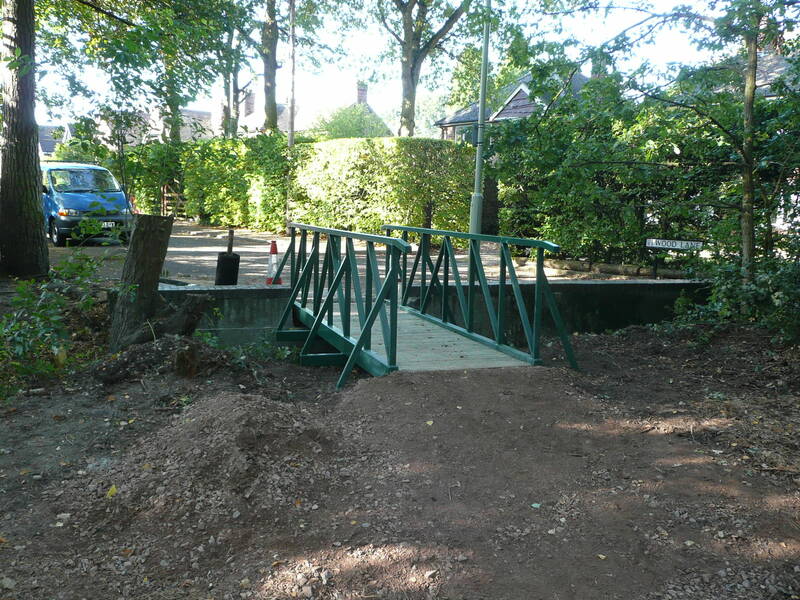 Cleared of rust, widened with new metalwork, galvanised and brightly painted green, the refurbished bridge was lowered into position at the end of Wood Lane. 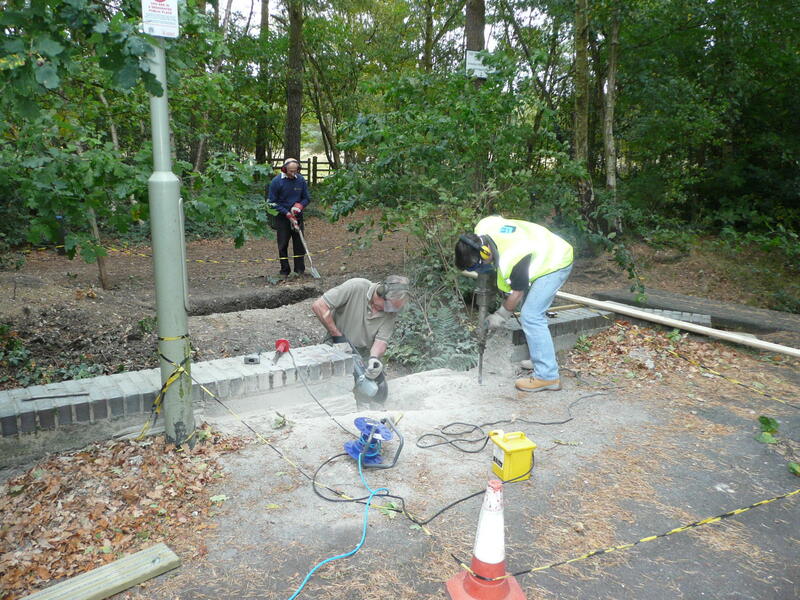 Volunteers from the Society, along with the Countryside Rangers, installed the foundations needed to support the bridge. A shiny new plaque reflects the original dedication, as well as recognising the large part played by Cove Industries in the refurbishment. The old plaque was presented to representatives of the Fleet & Crookham Local History Group who spoke of the importance of archiving such pieces of historical interest. A large new steel and wood bridge was installed earlier this year over the culvert where the original ‘Carnival Bridge’ stood. 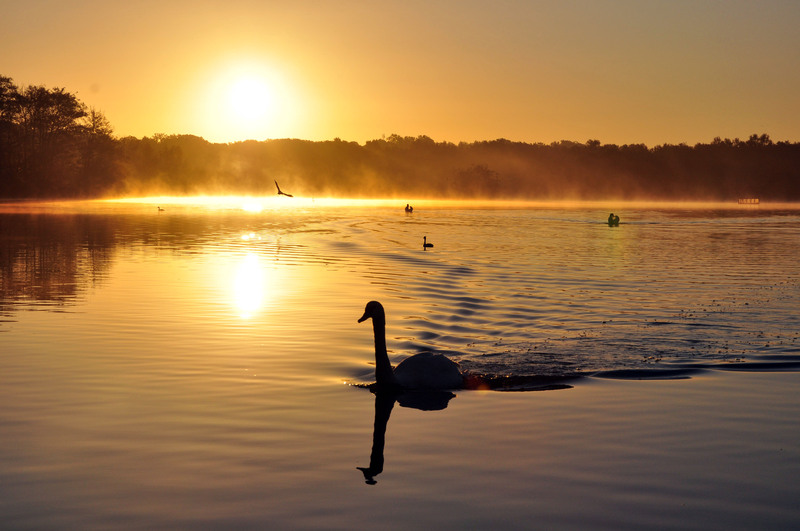 If you would like to help support Fleet Pond Society (FPS) in it’s activities, please consider joining (details on the tab above). We’re always very keen on new members! 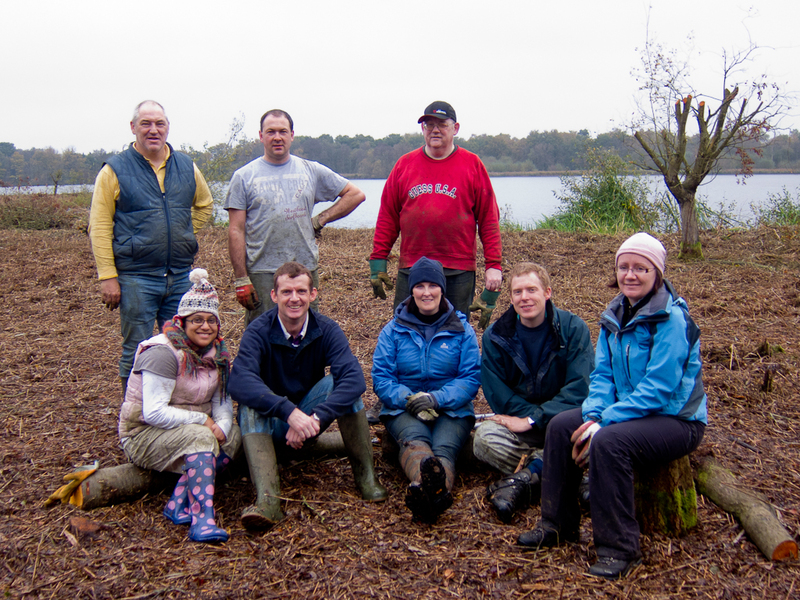 The last Sunday volunteer event for 2011 will take place this weekend. “After some debate on soil conditions and jobs needed, we have decided on a change of location for the December task. 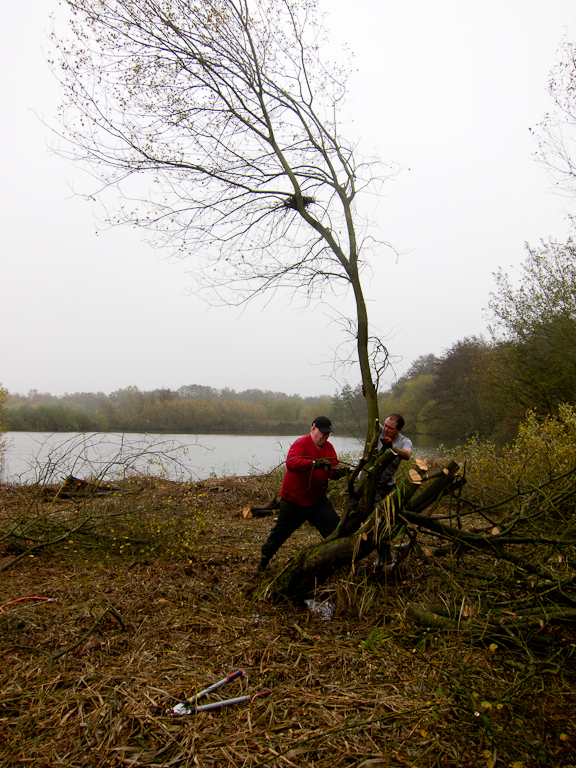 Brookly Reedbed has been cleared of most of the invasive trees and scrub but there is still some tidying up to do and quite a lot of cut material to burn. As the plan (subject to weather) is for a large bonfire and some baked potatoes this time Brookly seems the ideal place to go. Meet at the Countryside Workshop as usual at 9.15 a.m.
For any newcomers the Workshop in Old Pump House Close has a postcode GU51 3DN. However, one visitor found her SatNav took her to Pond View Close so look out for 65 Kenilworth Road as the Old Pump House Close is beside it. The locations referred to above can be found on the map given in the About page (above) to this blog. New volunteers are always very welcome! We meet at the Countryside Workshop, Old Pump House Close (next to 65 Kenilworth Road) at 9.00 a.m. for a 9.15 start. Signposted directions to the site are available if anyone comes late. Volunteers will need old clothing, waterproof if rain is expected, protective gloves and wellington boots (we have a supply of gloves and boots if you do not own these). Current volunteers comprise a wide range of ages of both genders. We’re a very friendly bunch and we’re always keen to receive new volunteers, including students on the Duke of Edinburgh and Trident schemes. To get a flavour of previous volunteer events (including many photos) please use the search facility on the upper rhs of this blog (type eg ‘sunday’). You are currently browsing the Fleet Pond Blog blog archives for December, 2011.